No purses, bags, wristlets, or cases of any size are allowed in Michigan Stadium. Michigan Stadium gates open (Gates 2, 4, 8, 9, 10) at 8:00 a.m. - all graduates, family members and guests are required to have tickets. Graduating students must wear a cap and gown. Graduate procession into stadium starts at 8:45 a.m.
Spring Commencement ceremony begins at 10 a.m. and ends at approximately 11:45 a.m.
For those who can’t attend the ceremony, spring commencement will be streamed live through the U-M website, and will also be broadcast on Comcast channel 22 in the Ann Arbor/Ypsilanti area. Several college or program-specific events will be held throughout the weekend. Due to limited parking near Michigan Stadium, we encourage guests to use the complimentary shuttle service to and from area hotels and parking lots. Service will begin at 7:45 a.m. and will run approximately every 20 minutes until 9:45 a.m. Buses will resume operation at the end of the commencement ceremony. 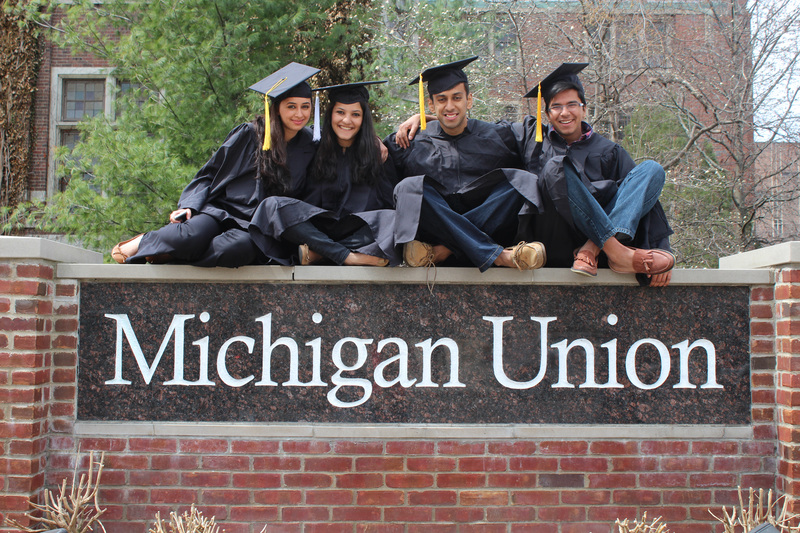 For all details, visit U-M’s official Commencement website. The Ann Arbor Area Convention and Visitors Bureau website to find out about local hotels and restaurants. Live traffic updates using Google maps. Call or visit Campus Information with your campus/Ann Arbor questions at (734) 764-INFO. They are open 19 hours every day and ready to answer your questions. University Unions has options to help "cap off" your special day! Michigan Memories Reception, a walk through the pictorial display in the Michigan Union art lounge, featuring noteworthy headlines from the Michigan Daily during the graduates' years at U-M. Light refreshments will be provided. ​Host Your Own Celebration on Campus with a reception, lunch, or dinner at one of the three distinctive unions at the University of Michigan. For more information call (734) 764-8837 or visit the catering website.